Estimation of radon situation and radioactive contamination of foodstuff. DANGER – more than 120 mcR/ hour. Signaling in case of battery discharge. 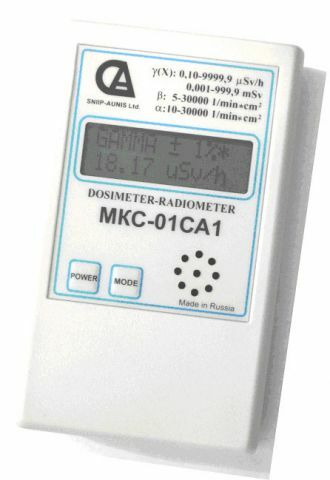 The Instrument allows performing operative search of contaminated items or radioactive radiation sources, and human environment monitoring (radiation safety of working places, residential premises and country; estimation of real objects radioactive contamination, of foodstuff, materials and samples; estimation of radon situation in residential and industrial premises etc.). Voice insonification and operative voice analysis of radiation situation estimation results allow increasing convenience of MKS-01SA1B use both by individuals and by officers of various services. Radiation detector is a gas-discharge counter. Voice indication of dose rate measuring results with periodicity once a minute. Range of dose rate measuring is 0.1 – 999.9 mcSv/hour. Range of integral dose measuring is 0.001 - 999.9 mSv. Range of beta-particle flux density measuring this flux being emitted by contaminated surfaces (Strontium-90 or Cesium-137, part./(min. *cm2) is 5 – 30,000. Range of alpha-particle flux density measuring (Plutonium-239), part./(min. *cm2) is 10 – 30,000. Range of energies for registered photons, MeV 0.05 - 3.0. Lower limit of registered beta-radiation energy does not exceed 0.05 MeV. Lower limit of registered alpha-radiation energy does not exceed 3.0 MeV. Set by the user dose rate signaling thresholds with the interval of 0.1 mcSv/ hour are for the whole measuring range. Set by the user beta-particle flux density signaling thresholds with the interval of 1 part./(min.*cm2). Set by the user gamma-radiation integral dose signaling thresholds is mSv (with the interval of 0.001 mSv). Indication of measuring results and its statistic error is continuous. Periodicity of display indications change is 1 second. Casing design: casing is made of plastic. Power supply: two AA DURACELL MN1500 batteries. Continuous operation time with one set of batteries is at least 400 hours. Operation temperature range is from minus 20 to + 50oC. Dimensions are 112 х 64 х 30 mm. Weight does not exceed 200 g.